The focus is on how the Jews were affected by Polish independence in 1918. 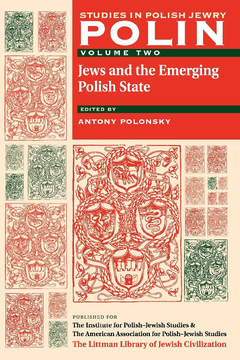 Other topics covered include Jan Blonski's article ‘The Poor Poles Look at the Ghetto’; Polish historiography on the privileges granted to the Jews; the decline of the kahal in the eighteenth and nineteenth centuries; the social perception of Jews in the eighteenth century; representations of Jews in nineteenth-century literature; nineteenth-century synagogues; the Jewish Polish-language press in the interwar period; and antisemitic slogans in Endecja political campaigns. CONTRIBUTOR: Wladyslaw T. Bartoszewski, Research Fellow, St Antony's College, Oxford. Eugene C. Black, Ottilie Springer Professor of History, Brandeis University. Andrzej Bryk, Lecturer, Institute for Constitutional History, Jagiellonian. University, Kraków. Jan Blonski, Professor of the History of Polish Literature, Jagiellonian University, Kraków. Sh. Cygielman, Senior History in Jewish History, Ben-Gurion University of the Negev, Beer-heva. David Engel, Tel Aviv University. Mieczyslaw Inglot, Professor of Polish Literature, University of Wroclaw. Paul Latawski, Assistant Professor of International Relations, New England College, Arundel. Eli Lederhendler, Lecturer in Jewish History, Tel Aviv University. George J. Lerski, Emeritus Professor of Modern European History, University of Chicago. Józef Lewandowski, Professor of History, Uppsala University. Maria and Kazimierz Pietchotka, architects and architectural historians. Edward Rogerson. Szymon Rudnicki, Docent and Deputy Director, Historical Institute, University of Warsaw. Michael G. Steinlauf, Brandeis University. Daniel Stone, Professor of History, University of Winnipeg. Bernadeta Tendyra, London School of Economics. Anna Zuk, Lecturer, Institute of Philosophy and Sociology, Marie Curie-Sklodkowska University, Lublin.